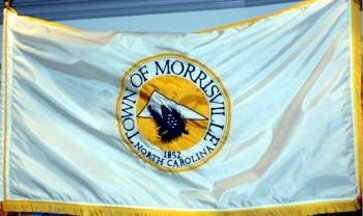 The flag of the Town of Morrisville, North Carolina, consists of white background with town seal on it. The seal shows a mountain (or triangle) and a pine branch, and "TOWN OF MORRISVILLE" and "1852/NORTH CAROLINA" around. Photo of the flag thanks to Diana Davis, Town Clerk, Town of Morrisville. "Morrisville is a town in Wake County, North Carolina. A small portion of the town extends into Durham County. The population was 5,208 at the 2000 census. In 2006 the population had risen to 13,501, a 159% increase. Morrisville is part of the Research Triangle metropolitan region." - from Wikipedia: en.wikipedia.org/wiki/Morrisville,_North_Carolina.